Afrah Nasser's Blog: Will Tomorrow be Better than Today? 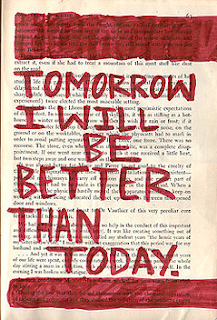 Every day she keeps on telling herself, that tomorrow will be better than today. She secretly convers herself and keeps on doing so because that's the only way she knows things could be better. She has been talking to herself for over one decade; since she started to form her own individualistic identity. It wasn't easy at the beging..in fact, it was so problematic! She was in a constant fight with her family and her own self. "Why am I fighting so much? Maybe I'm not close enough to Allah and that's why I'm in a constant distress? ", she asked herself. Then, she wore the veil and covered her face because, - she thought- that was how she would be closer to Allah. She basically thought the veil would make tomorrow better than today. She kept talking to herself, while wearing the veil and she still kept fighting with her family. Then, suddenly, she was introduced to writing. She wrote her inner conversation on her diary. Tomorrow was about to be better than today but not completely. The fight took a differnt dimenion. It was about deep principles not just superfcial desires. She kept talking to herself and writing that down. Sometimes she felt good and sometimes she felf misrebale. "Why am I feeling so much misery? Maybe I'm not close enough to Allah and that's why I'm in a constant distress? ", she asked herself again. Months passed and she took off the veil. "There has to be a better way to get closer to Allah than putting this fabric on my face!," she realized. Years passed, she met him. He kissed her. Her world turned upside down. Life seemed strange to her. "Oh! I made Allah mad! I'll go to hell," she sadly thought. Then, she tried to make peace with that and decided that his kiss would make tomorrow better than yesterday. His disgraceful manhood made her hate him. Eventually, they went apart. 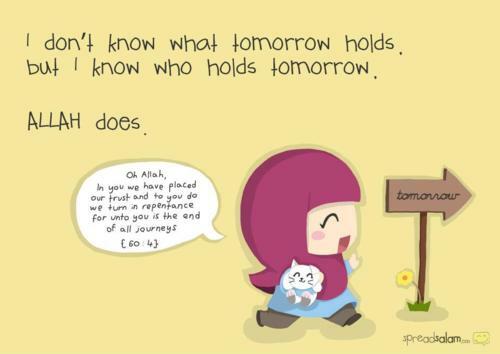 She was obbsessed of how to make tomorrow better than today. She changed her fight against her family to her fight for her womanhood. One thing led to another, she eventaully was fighting for her surrvival. Today, she reailzed there was no such thing like "tomorrow better than today." Seeking peace, happiness, spirtuality and closeness to Allah is a process. It's a continuous process. It's not about going from A to B! It's about the journey and current moments. It's living the now and making sure that now is as better as it gets!